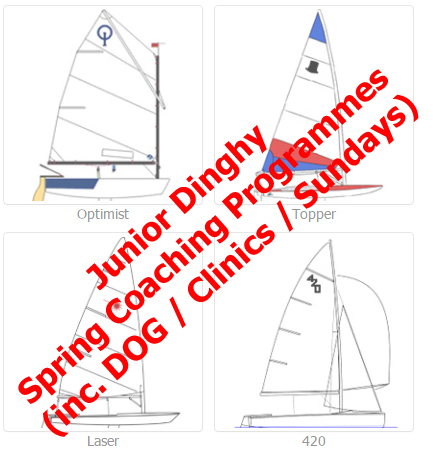 [post_content] =>  Registrations are now open for ALL our SPRING junior programmes for Optimist, Toppers  and 420 at ALL levels! So, if you want to register your child for a 420 clinic, the DOGs or our Club junior Spring coaching on Sundays, please use the form below. - Some programmes and specialist clinics are open to non members. - For 420s, one form is required for every child! Beware! Though you will only be presented with what is relevant to you at any given stage of the registration process, the form is quite complex and requires you to fill each field in order to ensure a successful registration...so please take your time at every step! If you are interested in Feva training this Spring, please contact JO Fiona Staunton, fiona_staunton@hotmail.com for further details. Registrations are now open for ALL our SPRING junior programmes for Optimist, Toppers and 420 at ALL levels! So, if you want to register your child for a 420 clinic, the DOGs or our Club junior Spring coaching on Sundays, please use the form below. Important notes: – Some programmes and specialist clinics are open to non members. – For 420s, one form is required for every child! – NYC Club boats optional charters (8 Optimists / 11 Toppers) are also booked through this form (for NYC members only!) Beware! Though you will only be presented with what is relevant to you at any given stage of the registration process, the form is quite complex and requires you to fill each field in order to ensure a successful registration…so please take your time at every step! If you are interested in Feva training this Spring, please contact JO Fiona Staunton, fiona_staunton@hotmail.com for further details.